We sip a light and refreshing lemon elderflower soda + rose wine cocktail. Kelsey shares some big job news - she quit her job! So we chat all about what it's like to quit a job to follow a creative passion. 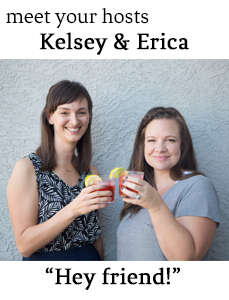 Erica shares her experience doing this several years ago and Kelsey shares details about how she came to her decision and what she'll be doing now. It will definitely include podcasting with Erica in the daylight hours. Kelsey is loving her simple hammered circle earrings from ABLE. Erica is loving on a few items from our favorite grocer, Trader Joe's: toasted coconut granola + Greek yogurt with honey, salt and pepper potato chips, and cooked gyro slices.